Frilight Targa 8990 plastic courtesy light has a rubber O-ring to provide a waterproof seal. Choose from halogen or LED bulbs as well as a shiny chrome or flashy white finish to complete your boat lighting regime. Targa's waterproof construction and frosted lens lend to its hardy nature. 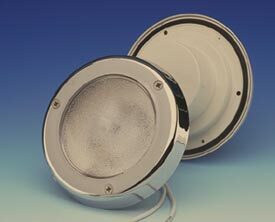 The 8990 recessed mount boat light brings your boat light arsenal to a frosty peak of fashion and function in an IP64 water resistant fixture. Select energy efficient 12 SMD G4 LED or G4-pin halogen bulb. LED functions on inputs from 10-30 volts DC while the Halogen bulb functions on a 12 volt DC input.